The MG Six as it was first known was introduced at the 1928 Motor Show and accompanied the 14/40 that was now in its fourth year of production. It was becoming apparent that if public interest was to be maintained in the new MG marque that a new model was needed, hence the launch of the 18/80 model. The significance of the 18/80 was that it was the first 'real' MG because the earlier flat radiator and bull nosed cars held such close ties with the Morris equivalents and Cecil Kimber MGs General Maanger had up till then been charged with upgrading the Morris's to give them wider appeal. The new 18/80 was a car that could be described as a marque on its own as the vast majority of the mechanical components were totally different to those of the current Morris. 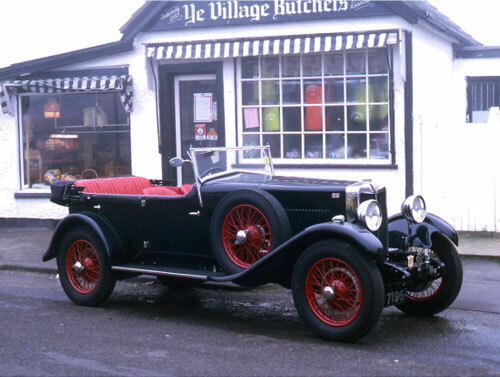 During 1927 the Morris Light Six was announced which was powered by a two and a half litre, six cylinder engine. An unusual departure for Morris was the fact that the camshaft was above the valves operating through L' shaped rockers. However the car did not reach the production lines and this particular power unit was eventually used in the Morris Major and after that in the Isis. The chassis of the Morris Light Six was not sufficiently rigid enough to cope with stresses imposed by the powerful 60 bhp engine and was redesigned and renamed the Morris Six with little better results. Kimber however saw the potential of this engine for the 18/80 project and Morris Garages purchased a Light Six fabric saloon for evaluation. A brand new chassis frame was made and it was the first time that a chassis unique to MG was produced, all previous ones had been based on the standard Morris chassis. By the time of the 1928 Motor Show, the Light Six engine had been modified with a new block to accommodate twin carburettors that were mounted low down underneath the exhaust manifold with the inlet passing through the block and up to the ports in the head. The cylinder block and crankcase were made in one single casting with a separate cylinder head. A strong 4 main bearing crankshaft was employed with a Duplex chain and gear drive to the camshaft, tensioned, by a spring loaded eccentric tensioner. The chain was also utilised to drive the distributor, water pump, oil pump and dynamo all via a single skew gear shaft which occasionally led to running problems. The very latest shell-type big end and main bearings were used which contributed to the very smooth and quiet running of the power unit. The 18/80 was beautifully constructed with painstaking attention to detail even the bulkhead support brackets incorporated a fine MG motif set into the aluminium. Unfortunately these were hidden from view when the bodywork was mounted onto the chassis. Front and rear axles were designed by MG and utilised Perrot type brake gear. Maries steering gear was used and early prototypes had 14/40 type bolt-on wheels, however all the production cars employed Rudge-Whitworth centre-lock wire spoke wheels. The dashboard displayed quality Jaeger instrumentation whilst the steering wheel was adjustable for rake. Behind the dashboard, and mounted on the engine side of the bulkhead, was a reserve petrol tank and an oil tank of one gallon capacity which fed oil directly into the crankcase. For the first time a fly-off handbrake was used, mounted inboard on the tourer and saloon versions but externally on the speed twin model. Probably the most noticeable feature however was the distinctive new radiator design with the vertical colour-keyed slats and MG Octagon. This basic design of radiator grille was to be used on MGs throughout the years right up to the end of the T series cars. Upon introduction the basic price of the chassis only was £420, the buyer could then specify either a tourer or saloon body. The tourer cost a mere £65 extra and the saloon another £135 which by today's standards seems very cheap! The tourer was endowed with a fairly light body compared to the saloon and this allowed pretty brisk acceleration and good top speed compared to the rivals of the day. The MG could easily out accelerate the Lagonda and Alvis models that already held good sporting reputations. In addition to speed the 18/80 had fine responsive steering, excellent roadholding and the three speed gearbox did not prove a drawback due to the good torque characteristics of the engine. In 1929 a new chassis was designed of much sturdier construction, with a wider track to be designated the Mark 2. This was not to replace the Mark 1 but to sell alongside it and it really must have confused prospective purchasers. The Mark 2 engaged a track some 4" wider than the Mark 1 and the already sturdy chassis was heavier than its predecessor. The end result was that the Mark 2 was considerably slower than the Mark 1, especially as there was no increase in power from the same engine. This coupled with the fact that the car was priced at £100 more, made the car difficult to sell. Other improvements were the provision of a four speed gearbox, uprated cable operated brakes and bodywork of higher standard incorporating wider mudguards. The chassis, although giving greater rigidity and allowing the use of softer road springs, was a penalty against performance. During 1929 the Mark 1 was improved, being fitted with uprated cable operated brakes and in 1930 a speed model was introduced. A guaranteed' 80 mph was claimed for the speed model and a Mark 2 version was also offered but again suffered with the added weight of the chassis and this detracted from the good acceleration for which the Mark 1 was admired. Probably the ultimate 18/80 was the Mark 3 which was an attempt to turn this fine vehicle into a racing car. It was loosely based on the Bentley racing models of the day and constructed on the Mark 2 18/80 chassis. The engine was modified and had a cross flow head, the first time one had been used on an MG. A new crankshaft, camshaft and pistons were fitted and dry sump lubrication completed the package. The model became known as the 18/80 Tigresse and variously as the 18/100 because of attempts that were never realised to try and produce 100 bhp and 100 mph. The car certainly looked the part and its outside exhaust ending in the obligatory fishtail, cycle wings, louvred chassis panels and leather bonnet strap, however weight was again a problem penalising the performance. Competition appearances of the car were few and far between with its first outing in the Booklands Double Twelve 24 hours race in 1930, ending in disaster. The engine seized after running its bearings and to make matters worse an MG Midget managed to stay the course and finish with a team prize. There was very little public interest shown in the ready-to-race Mark 3 and only five cars were ever produced, somewhat less than the 25 that Cecil Kimber had hoped for. It was hardly surprising considering the cars carried a £895 price tag. The Mark 1 stayed in production until early 1931 and the Mark 2 continued through into 1932. New models were available from stock up until 1934, selling very slowly. This was a reflection of the depressed state of the world economy rather than on the car itself. Number of cylinders: 6 in line. Bore and Stroke: 69mm x 110mm. Valve operation: Chain driven, single overhead camshaft. Power output: 60 bhp @ 3,200 rpm. Clutch: Double plate, cork inset, automatically lubricated. Suspension: Semi elliptic front and rear. Brakes: 12" drum, Perrot type (early cars). Cable operated (later cars).